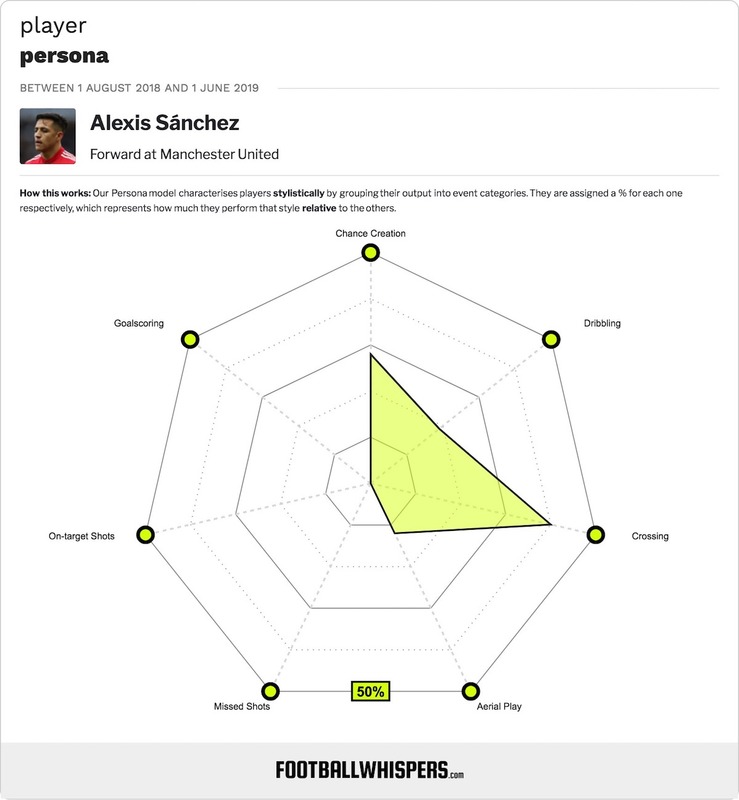 Manchester United fans had reason to be optimistic about Alexis Sanchez this season. The Chilean didn’t meet expectations in the second half of the 2017/18 campaign following his move from Arsenal in January but, having had a full summer’s rest, United fans expected the 29-year-old back for the new season fully fit, refreshed and ready to fire on all cylinders. While several of his United teammates missed much of pre-season following their World Cup exertions, it was Sanchez who looked curiously sluggish and lacklustre in the 2-1 win over the Foxes at Old Trafford. Three points may have shielded United’s underwhelming display from scathing criticism but Sanchez’s toils were hard to ignore. 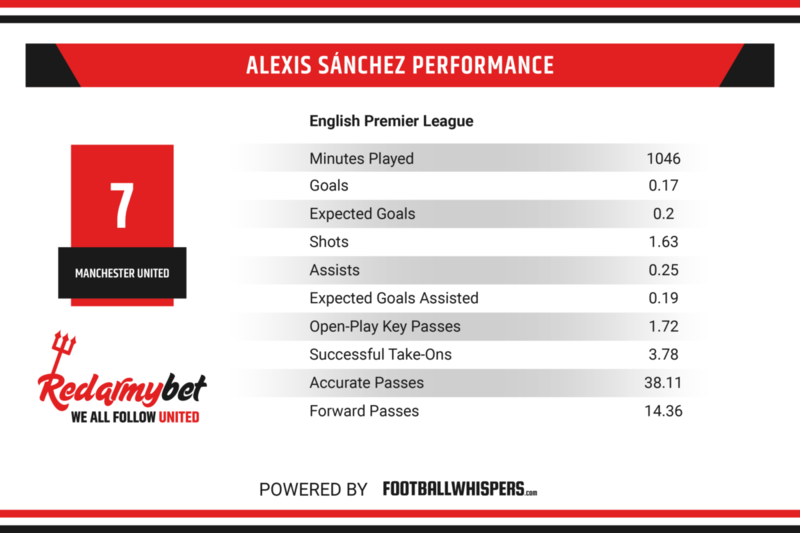 Here, our friends at Football Whispers analyse why Sanchez needs to recapture his best form as the Red Devils look to depose rivals Manchester City at the Premier League summit. United’s capture of Sanchez from Arsenal – with Henrikh Mkhitaryan going the other way as part of a swap deal – was considered a major coup. Six-and-a-half years at Barcelona and Arsenal cemented the South American’s status as one of European football’s most exciting and devastating forwards. Edging out Manchester City in the race for Sanchez’s signature, too, would have been of immense satisfaction to Ed Woodward and Jose Mourinho. Sanchez’s arrival was supposed to breathe new life into United and offer a welcome jolt to kickstart the momentum at a critical juncture in the season (although Mourinho’s men had already lost touch with City in the title race, they still had the Champions League and FA Cup to compete for). But he failed to bewitch the Old Trafford crowd with his dazzling abilities and, for much of his time in a United shirt, has cut a forlorn figure, a shadow of the effective forward who scored 30 goals for Arsenal in the 2016/17 season. Going missing in big games didn’t help, like in the defeat to Chelsea in the FA Cup final or against Sevilla as United exited the Champions League earlier than expected. Sanchez scored three goals and created five more in 18 appearances for United last season. And there were flashes of vintage Sanchez brilliance, too, with his key role in United’s comeback victory at Manchester City particularly standing out in the memory. The Chile international’s all-round standard of play, however, was more alarming. Sanchez only managed two Premier League goals against an expected goals (xG) of 2.38, while his post-shot xG – a measure of shot quality – of 2.07 ranked him 92nd in that category, suggesting that the forward failed to take advantage of his scoring opportunities. One of the most glaring and well-documented regressions in Sanchez’s game has been his decision-making in possession. For Arsenal last season, he lost the ball 49 times in 19 games compared to 35 in 12 for United, meaning his dispossessed average per 90 rose from 2.92 to 3.01. This again haunted Sanchez during the win over Leicester. With only five out of 11 completed passes in the final third, it’s clear he wasn’t at his razor-sharp best. Two of Sanchez’s key passes teed up teammates; one for Juan Mata, who shot wide, and the other for Romelu Lukaku, who was thwarted by Kasper Schmeichel in a one-on-one. However, Sanchez’s failed attempts to find United players throughout the match attracted murmurs of discontent from the Old Trafford crowd and often broke down promising attacking situations for his side. Sanchez’s failure to hit the ground running in the new season has encouraged a lot of knee-jerk reactions, as is customary in today’s social media-dominated football culture. However, having enjoyed an extended break and a full pre-season, his struggles to regain sharpness feed into the wider debate about the player; is he going through a prolonged rough patch or is he genuinely in the early stages of decline? Sanchez has played a lot of football over the past decade. A lot. Still only 29, he has amassed nearly 600 appearances (567) at club level. That’s more than Wayne Rooney had managed by the time he was 29 and the former United striker was evidently on a downward trajectory by the time he left the Red Devils in 2017. Add to that 121 caps for Chile and Sanchez has close to 700 games under his belt before reaching 30. He has played club football in five different countries while international commitments produced three long, draining summers in succession between 2014 and 2016, as La Roja reached the knockout rounds of the 2014 World Cup before clinching back-to-back Copa America titles in 2015 and 2016. Sanchez must now extinguish any debate about his decline and play a starring role in United’s attack on a more consistent basis. If Mourinho’s men are to mount a serious title challenge this season, they need Paul Pogba to perform, Lukaku to find the net regularly and Sanchez to rediscover the form that earned him countless rave reviews at Arsenal.